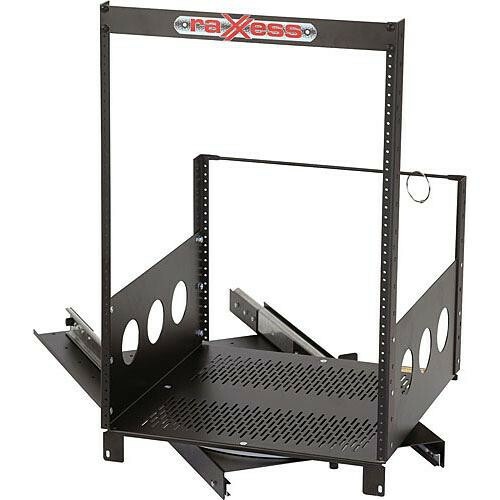 The ROTR-XL-11 ROTR Roto Rack System from Raxxess is a 11 space rack system that can be installed in cabinets and other such confined spaces. It's been designed to slide out, and to turn in a 90 degree angle to either side to allow access to the rear of the rack. When installed in a cabinet with doors, the sliding base features an extension to accommodate the extra length so the ROTR-XL-11 can still turn in either direction. It also features a three position locking system that holds the rack in place when pulled forward, to facilitate servicing the rack without it moving around. This model has a height of 11 rack spaces, is made out of cold rolled 12-gauge steel, and can support up to 300 lbs (136 kg) of weight. The back of the unit has a built-in cable management system to avoid tangles and to enable smooth operation.